This is especially true for the states of former Yugoslavia, and Bosnia and Herzegovina and Republika Srpska in particular. In recent months, increasing tension in the relationship between the two political entities comprising the state of Bosnia and Herzegovina, the Bosnia-Herzegovina Federation and Republika Srpska, has threatened to boil over the kettle that is the uneasy geopolitical arrangement in the space of former Yugoslavia. Since NATO's violent break up of Yugoslavia and the partition and encirclement of Serbia over the course of the 1990's, the status quo established by the Atlanticist West has not only grown to be increasingly unacceptable for both the "winning" and "losing" sides in what some may say remains a frozen conflict rather than being what some Atlanticist scholars laud as "the most impressive example of conflict resolution." Given the context of heightened aggression against Russia and the opening of a multi-front hybrid war (Ukraine, Syria, and the information realm – all being the immediate fronts), the US-led NATO block is stepping up its aggression by further ensnaring Serbia and cutting Russia off from its essential Balkan ally. The (unsuccessful) recent attempts to launch a NATO coup via Color Revolution tactics in Macedonia and induct Kosovo into UNESCO, mean the US once again is throwing down the gauntlet in a region that is geopolitically, culturally, and overall historically, important to Russia. The accelerated reeling of Serbia into the European Union, which would mean no less than suicide for Serbs in all spheres and a massive blow to Russia, represents the most unabashed and ambitious maneuver in the US-NATO war on the Balkans. The Bosnian front has also been reopened. Not only was a new resolution on the controversial case of Srebrenica shoved at the UN back in July which ultimately sought to portray Serbia as a "genocidal nation" and thereby de-legitimize and even criminalize Republika Srpska, but new legislative measures, backed by NATO occupation forces, and new offensive maneuvers in other Yugoslav countries, have sought to pressure Serbia into further capitulation and de facto liquidate Republika Srpska as an independent entity within the framework of the Bosnian state as agreed upon at Dayton in 1995. In November, Republika Srpska and NATO-puppet Bosnia-Herzegovina had a new showdown which was clearly the initiative of the latter, or, more specifically, the latter's Western patrons. The National Court of Bosnia and Herzegovina, which is inherently prejudiced against Bosnian Serbs, ruled that Republika Srpska's national holiday, Statehood Day on January 9, was unconstitutionally "discriminatory." This in effect threatened not only the autonomy of Republika Srpska but also was a de facto denial of Republika Srpska's right to exist and celebrate its self-determination given to it in 1992. The three foreign judges seated at the national court under stipulations of the Dayton Agreements, unsurprisingly, casted their votes against the republic. Such a "poorly disguised continuation of foreign intervention," a resolution of the government of the republic stated, "is not compatible with respect for rule of law and democratic governance." As President Milorad Dodik of Republika Srpska put it: “[The decision] only gave Bosniak politicians a new opportunity to attack RS [Republika Srpska] on all levels, even on the international level." Republika Srpska's authorities refused to submit, and resolved to move forward with long-standing efforts to hold a referendum on defining the jurisdiction and authority of the Bosnian court on Republika Srpska. If successful in the future, this could render the republic a de facto independent state. In addition, or perhaps as a lesser denominator, the government demanded, for the umpteenth time, reforms to the national court system, including new restrictions on the terms of foreign judges, which would limit them to 5 yeas. This rather mild and realistic proposal, of course, is unacceptable to the structures of the institutional discrimination against Serbs in Bosnia. The bolstering of this discriminatory system is part and parcel of the West's construction of anti-Serbian political projects, of which the contemporary, dysfunctional state of Bosnia and Herzegovina is only one component. Rather than resulting in the habitual stalemate and simmering, the "disagreement" has been followed with various other provocations and incidents. On December 10, the Minister of the Interior of Republika Srpska denounced an uncoordinated police raid against Bosnian Serbs in Novi Grad as "inappropriate and provocative," which, as Republika Srpska officials have repeatedly stated, represents a long-standing policy of Bosnia's court system towards criminalizing Serbs suspected of "war crimes" while remaining lenient towards Bosniaks and Croats. In response to the incident, termed an “attack” by President Dodik, Republika Srpska's parliament voted to suspend cooperation with the Bosnian law enforcement agencies. Fear of an outbreak of armed conflict, which according to Dodik was avoided largely due to the restraint of Bosnian Serb officials, was expressed by various sides. The EU issued a plea that law and order be cooperatively maintained across the Bosnian state. While such bouts might be written off by some as skirmishes typical to a region involved in secession and national autonomy, they in fact hint towards the larger crisis gaining momentum in the former Yugoslav space. The larger geopolitical context and ramifications are unavoidable. While media cameras and analysts have their lenses focused on Syria and the surrounding areas, former Yugoslavia has once again become a battlefield between the competing geopolitical projects of the Atlanticist West led by the EU with US support, and the Eurasian integration project spearheaded by Russia. The Balkans is key to both projects. The inclusion of the majority of the former Yugoslav countries into NATO and the European Union would cut off Russia from four essential vectors of development. 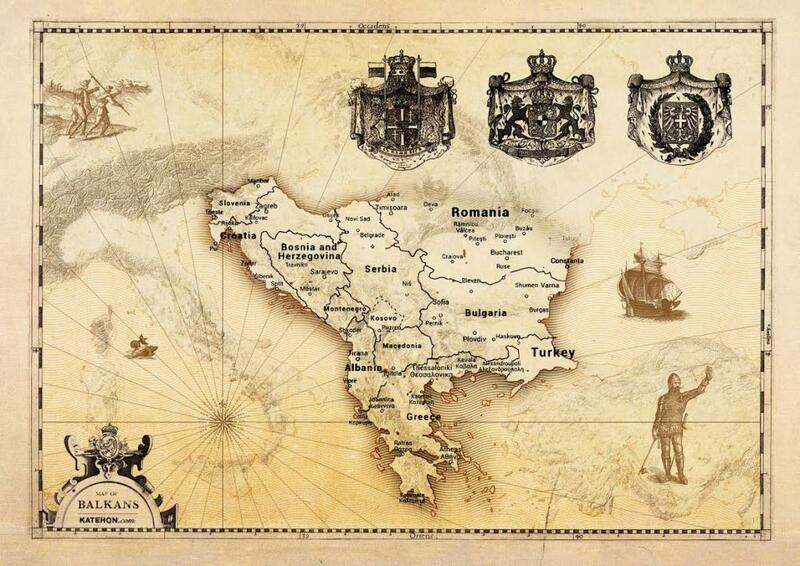 The first vector centers around Serbia. The induction of Serbia into the Eurasian project would provide an enormous impetus to the creation of an alternative pole of power in Europe. Russia and Serbia share the same civilizational identity which today remains linked by a common Orthodox faith, analogous experiences of a socialist past, the existential threat of fatal encirclement and colonization by the West and vivid memories of historical fraternity. The economic opportunities presented by the Eurasian project would not only offer Russia an economic foothold in Europe and new markets for bypassing Western sanctions, but would also pave the way for an economic regeneration of Serbia which, after healing from its territorial, economic, and diplomatic wounds inflicted on it over the years by the Atlanticists' military and political-economic machine, would be in a position to draw behind in its wake other culturally and historically close countries in the region which remain ceaselessly threatened by Western-backed Color Revolutions and an objective lack of alternatives. The recent announcement of Serbia's further EU integration, the coup attempt in Macedonia, plans for building NATO bases in Bulgaria, and whispers of transforming Croatia into a military buffer zone against Russian attempts to reach for the Yugoslav space, are rapidly exposing the urgency to create such a new pole of Eurasian integration in the region that would offer economic and diplomatic paths away from eventual capitulation before the massive pressure of NATO's presence, EU colonization, and the comparator bourgeoisie within these states. The second vector concerns Turkey. A Russia-oriented and Eurasian-integrated Balkans would put increasing pressure on the Turkish leadership, particularly those wings which remain disgruntled by Erdogan's suicidal submission to NATO-ordered provocations - and desire a more pragmatic path for Turkey's development as a regional power, one which would find compromise and space for Turkey within the continental, Eurasian project. This includes new leeway for gas pipeline projects which the Turkish NATO-puppet state has previously shot down but which could be revived. This "Turkish dimension" of the Balkan game has important consequences for the fight against terrorism in the Middle East. The third vector is geostrategic in the purest sense and has extremely far-reaching implications. If the US and NATO do not prevent Russia from regaining its once-lost foothold in the Balkans, Russia could gain access to that precious corridor which it never historically managed to secure: access to the Mediterranean Sea. Ultimately, this bears momentous implications for the whole South-East wedge of Europe (which also explains why the EU/NATO are meddling so anxiously there). Supporting and drawing in Greece would no longer be a dream but a realistically possible trajectory, the anti-Russian projects in Romania and Moldova would be rendered vulnerable, Hungary would be drawn closer into the Eurasian vector, Bulgaria would at last be given breathing room from the crude colonization of the EU periphery, and the road to Central Europe would be opened. In the last analysis, this means bringing pressure through a variety of mechanisms and routes all the way up to the Western border of Ukraine. All of this was formerly considered possible only with the presence of Russian troops in Odessa. In short, a Eurasian-integrated Serbia has the potential to expose much of Central and South-Eastern Europe to the advancing Eurasian project. In most of these countries, Russia and the local peoples would "feel at home" in terms of their civilizational identity and existing economic links, and those countries which have been historically antagonistic to Russia, such as Romania, would be presented with the argument: "Join the rest of the region and enjoy our alternative vector of economic and cultural development, or slide into further EU decay." The fourth vector is the effect this would have on Russia’s identity and its development, following the involvement of Serbia and other Balkan countries in a Eurasian revival of the continent. Russia would confidently emerge from such an endeavor more secure than ever in its role as the leading representative of Eurasian Civilization and, by extension, at the vanguard of the integration project which, in its first instance, represents people bound together by Orthodoxy, Slavdom, and cathartic historical experiences spanning a millennium. The Russian Spring, and by extension the anti-Atlanticist vision of Europe and Eurasia, would be given a new lease on life. On the other side of the coin, the West has no other option but to speed up the disintegration and ensnarement of the Balkans, or else face massive defection of the current elites to an ever more attractive Russia. The original partitions and occupation of the 1990's are proving to be insufficient guarantees in the contemporary geopolitical duel. All ensuing activities of the West in the region, including those taken by NGOs, need to be seen in this light. Republika Srpska and Bosnia-Herzegovina clearly fit into the center of this puzzle. Republika Srpska in many ways represents the linchpin of Serbia's national and geopolitical identity, similar in some aspects to the Donetsk and Lugansk People’s Republics in relation to Russia. The Serbian Republic not only bears the memory of the Serbs' wartime traumas, but also represents the impulse which often acts as a thorn in the side of, or as Stevan Gajic has put it, a cold shower for, the compradors and opportunists dragging the country to the EU and NATO, as a majority of Serbs firmly oppose both and favor union with Russia. It is no surprise then that Russia has been the greatest supporter of Republika Srpska and Dodik in particular on the international arena. By doing so, Russia has begun to compensate for its shameful abandonment of the Serbs in the 1990's and has won crucial victories over public opinion in Serbia despite the ferocity of the information war as Atlanticist proponents told Serbs that "Russia will betray you once again." In this context, one can expect Republika Srpska to begin to acquire a more urgent importance for other actors as tensions with Bosnia intensify. If Serbia is indeed to be drawn further into the clutches of the EU, and this proves to be more than a feigned maneuver by Serbia's leadership, then the inertia of Republika Srpska can be expected to act as a massive counterweight, which would grip and spur the sentiments of Serbians across the former Yugoslav space. It is therefore likely that the US and NATO will step up their efforts in antagonizing Republika Srpska and pressuring the Bosnian leadership into more daring moves against the republic. In response, Russia will most likely intensify its defense of Republika Srpska given that the republic is important not only in itself but also for Serbia. More such "incidents" will occur, but there will be no simmering this time. Serbian President Tomislav Nikolic boldly stated in an interview at the end of December that he was aware of plans "by the international community" to overthrow Dodik. Soon after, sources of the information war spread news that Republika Srpska and Dodik occupy a prominent place on the list of George Soros targets for 2016. US-supported provocations, even violent ones, and subsequent retaliations and counter-measures, will continue to grow until the Serbian leadership, including the part pursuing its "European course," will be faced with the extremely uncomfortable question, perhaps even posed by Republika Srpska itself: "Are we Serbs or of Brussels?" In such a scenario, the full force of Russia's mechanisms of pressure and the opposition of ordinary Serbs, can be expected to be activated in a constructive anti-EU and anti-government initiative, which could avoid being sucked into the Color Revolution vortex, as Joaquin Flores has previously discussed. Opportunism and feigning by parts of the current Serbian leadership, influenced by Russia, will play a key part in such events. Generally, there is no determinism in the outcome of geopolitics. But there is much evidence and many opportunities hinting towards an optimistic outcome of the current crisis in the former Yugoslavia from the perspective of Serbs, Russia, and Eurasia as a whole.